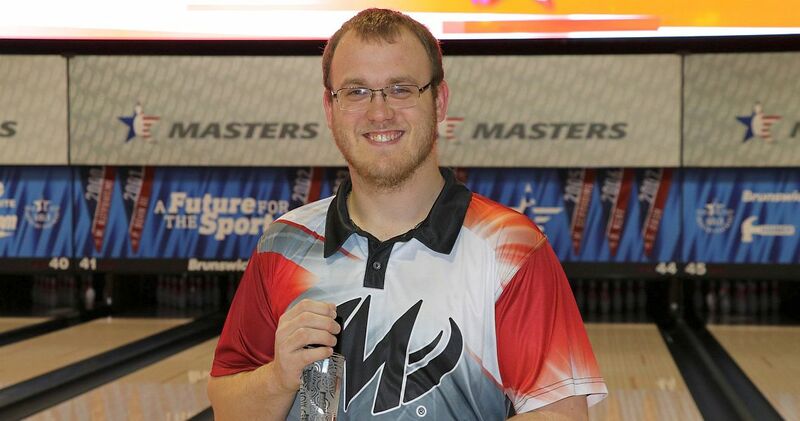 The year Jacob Kent of Newark, New York, was born, his father, USBC and PBA Hall of Famer Doug Kent, won the first of his two USBC Masters titles. Jacob grew up seeing that trophy, and many others, on a daily basis, and it motivated him to want one of his own someday. The younger Kent now is 26 years old and has his sights set on the 2018 edition of the Masters trophy, which is up for grabs this week at the Oncenter Convention Center in Syracuse, New York. He paced the sold-out 360-player field through the first of three days of qualifying, averaging 228 for five games Tuesday. 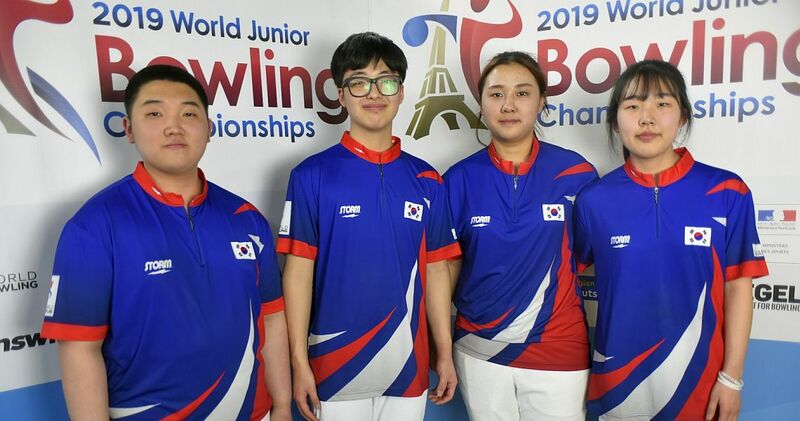 Kent’s 1,140 total landed him seven pins ahead of France’s Gaetan Mouveroux (left; 1,133), who was followed by Anthony Lavery-Spahr of Little Elm, Texas, and Wes Malott of Pflugerville, Texas (1,130), and Sean Rash of Montgomery, Illinois (right; 1,123). 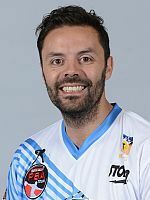 Defending champion Jason Belmonte of Australia finished the day in 26th place with a 1,066 total. “This is one of the tournaments I look forward to every year,” Kent said. “I think it’s one of the most prestigious events besides the U.S. Open, and I definitely think it’s the hardest to win because of how the match-play style is. Because Jacob Kent works full-time at a bank and part-time at his family’s bowling center, Doug Kent’s Rose Bowl Lanes, he doesn’t have much time to bowl, but he did everything to make sure he was ready for this week’s event. All qualifying and match play rounds of the Masters are covered live on Xtra Frame, the PBA’s online bowling channel. For subscription and schedule information click here. 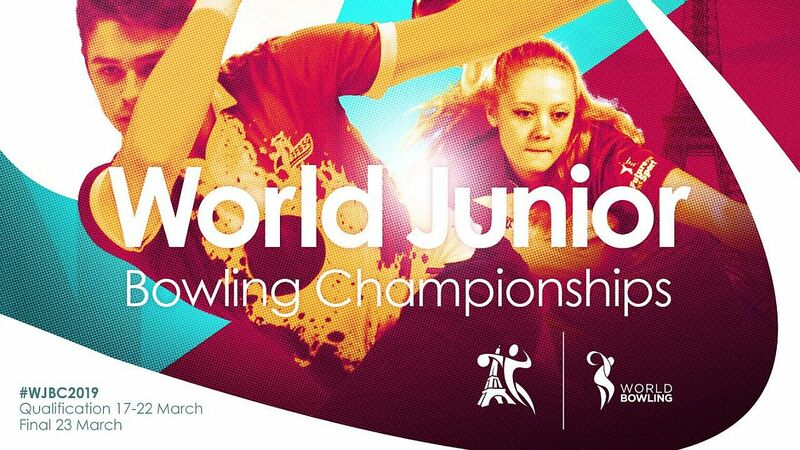 And, where competing approximately 60 miles from home might add pressure for some bowlers, Kent is embracing the opportunity to represent upstate New York on the lanes. Getting to sleep in his own bed also is a comforting bonus. 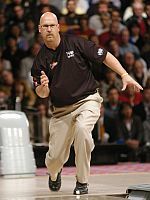 Oh, and there’s the unlimited support and sage fatherly advice from a 10-time PBA champion (pictured right at the 2006 Masters), whose list of accomplishments includes six standard PBA Tour titles and four majors, which earned him the No. 43 spot on the 2009 list of the 50 Greatest Players in PBA History. “My dad always says he’s past his prime, but he still throws it amazing,” said Jacob Kent, a former Junior Team USA member and collegiate national champion with Robert Morris-Illinois in 2013. 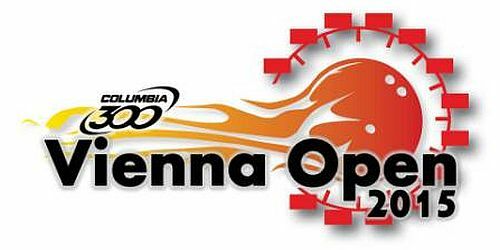 All competitors at the Oncenter Convention Center this week will bowl 15 games of qualifying over three days to determine the match-play field. The top 63 players will join Belmonte in the double-elimination bracket, where three-game total pinfall determines who advances. 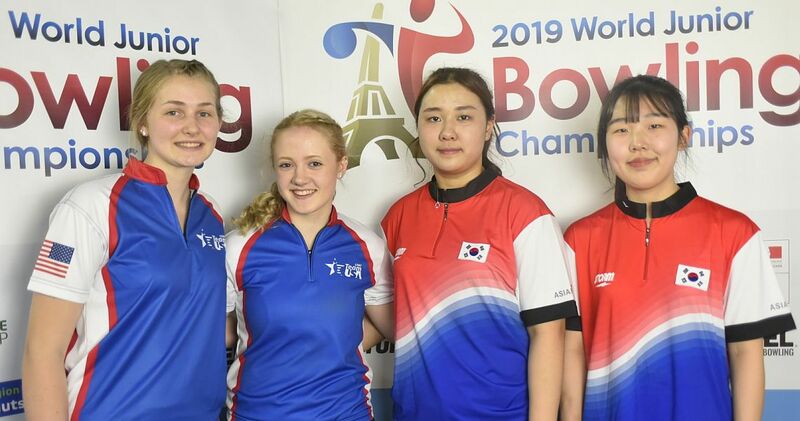 Match play will take place Friday and Saturday and determine the five players for the championship stepladder, which will be televised live on ESPN on Sunday, beginning at 1 p.m. Eastern. As the defending champion, Belmonte (left) is guaranteed the No. 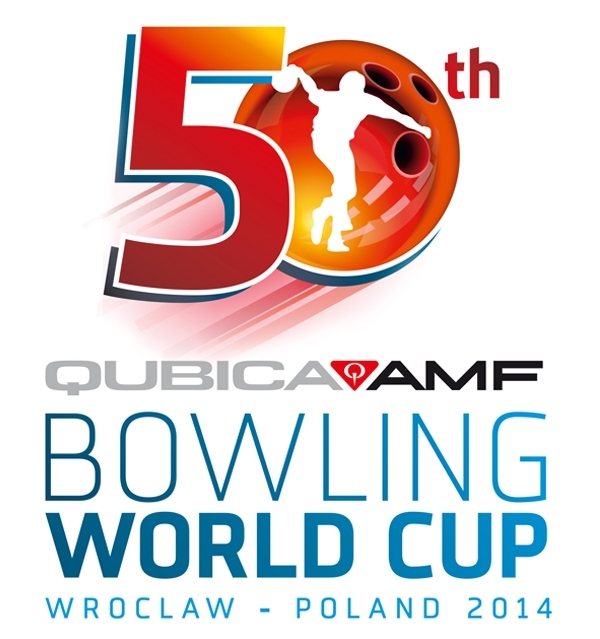 64 spot in the bracket, but bowling qualifying gives him a chance to improve his seeding, as well as get a feel for the bowling center and oil pattern. The Australian two-hander is seeking his fifth Masters title since 2013 and record-tying 10th career major victory. PBA Tour star Pete Weber and the late Earl Anthony share the record. 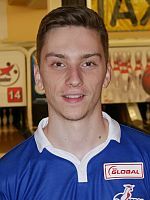 Jacob Kent’s five games Tuesday were contested on the “burn” squad, meaning one group of competitors already had bowled on the lanes before his squad. Each of the next two rounds, Kent will face a fresh version of the 40-foot oil pattern, which will require a completely different game plan. 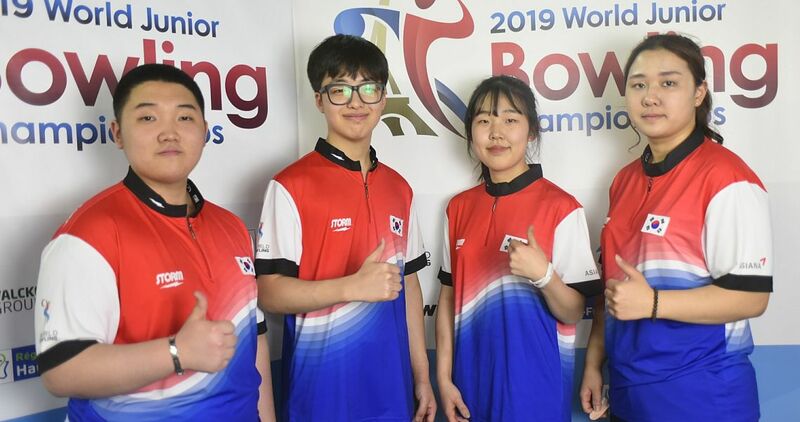 When he returns to the lanes Wednesday at 8 a.m. Eastern, the young right-hander will rely on a combination of what he experienced in practice Monday and what he saw throughout the day Tuesday. He’ll also consider what he learned in previous Masters appearances. 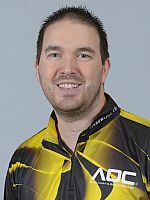 “I was kind of young and still learning a lot about the game when I bowled the Masters before, and I didn’t see it the way I do now, which is a lot like my dad does,” Kent said. When Doug Kent claimed his second Masters title in 2006, Jacob was in high school and unable to make the trip to Milwaukee due to his workload at school. 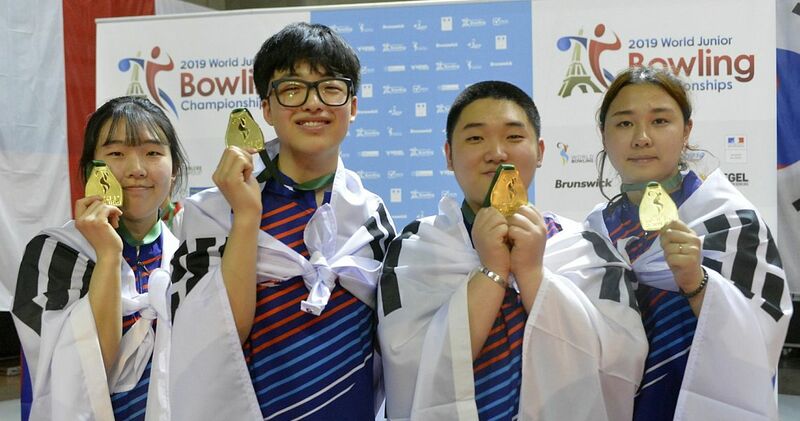 By then, though, he was old enough to understand the significance of winning such a prestigious event once, let alone multiple times, a feat accomplished by just eight bowlers since the event debuted in 1951. “My dad’s first title was the Masters in 1991, so I think it would be really cool if somehow I could carry on that legacy and win my first title at the Masters, too,” Kent said. Doug Kent finished the first day of qualifying Tuesday tied for 130th place with a 986 total. The 2018 Masters features a total prize fund of $270,000 and is a major event on the PBA Tour. The winner will take home $30,000. 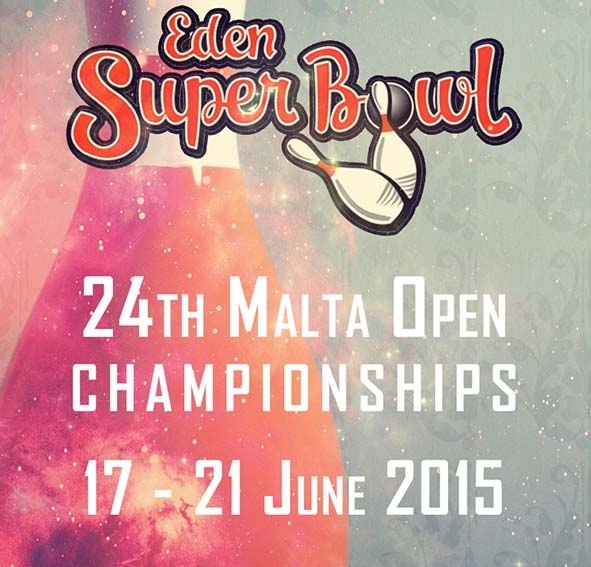 For complete Masters first round results click here.